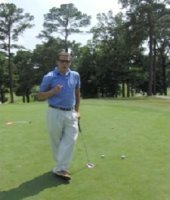 I am a 7 hcp and have always had a problem on my downswing in that my head drifts towards to the target, I do my best to stay centered but when things go wrong I can usually trace it back to my head moving toward target on my downswing. When I stay centered and keep my head back I can hit beautiful shots but lately I have been struggling. Anyway what can I do to correct this and also I hit about 85% of all my shots off center towards the TOE. When it is bad I hit thin, pulled short irons and a push every now and then with the driver. Any help would be greatly appreciated. I just started playing again and at 53 I am not as flexible as I once was but I know I can do better. Played 9 the other night and shot a 41 with an 8 the first hole a par 4 not a pretty sight. I will take my best stab at this and say that the main problem you have is that you are coming down too steep on the downswing with your short irons and driver. It is possible to hit a push with the driver due to a gear effect even though you may have a steep downswing. For example, if you were to make contact with an out to in path on the toe, the gear effect would cause the face to open in that split second to cause a push. 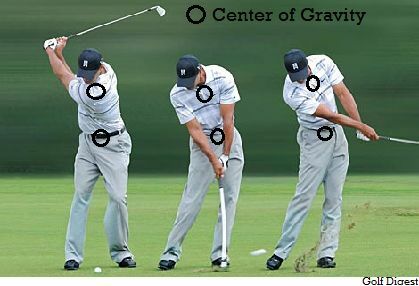 Some causes that may need examination would be the location of your ball, pivot, and flexibility. The location of your ball can have an effect on whether you are making contact on the front side of the arc or the back side of the arc. 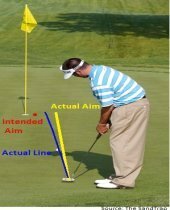 If you have the ball forward of the low point(towards target) then you would be setting up to hit a fade or pull. For more information on the arc visit the draw and the fade on how it relates to ball flight. Hip slide/turn can also be a problem if you're not creating enough separation between your hips and shoulders. Notice that having hip slide creates an axis tilt away from the target, which keeps your head back and makes it easier for the club to come down on the correct plane. Flexibility could be the issue in regards to creating separation of the hips and shoulders. If you're inflexible, this will cause these two components of your pivot to turn together which is resultant of a steeper downswing. One final issue could be that your left leg is straightening too quickly just before impact. This could also send the club down steep. So, be sure to work on the hip slide/turn and you should start noticing a difference. A good drill to work on would be to put a chair or an object just outside your left knee about 4 inches away. On the downswing your goal should be to slide into the object naturally and use half swings for this drill. I hope this information helps and if you have any further questions, please comment below.